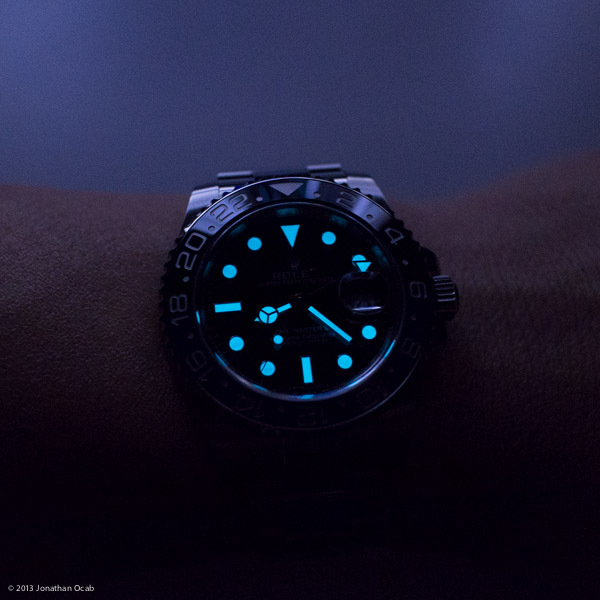 In a lengthy blog post I mentioned that I purchased the Rolex GMT-Master II 116710BLNR, otherwise known by other names including but not limited to Day-Night, Blue-Black, Blue-Noir, Bruiser, and Batman. 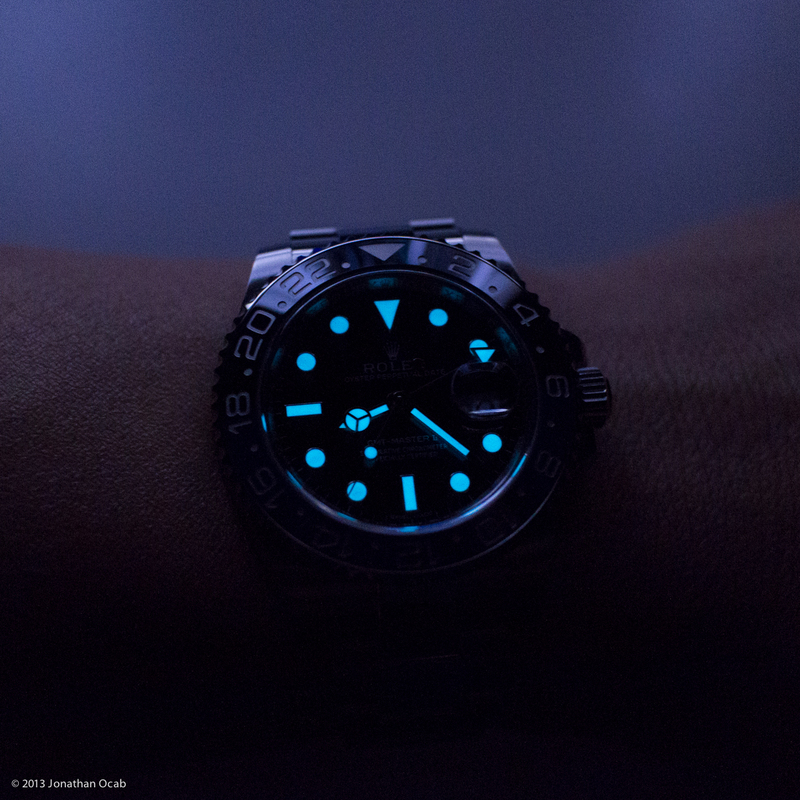 It’s been 31 days since I purchased the 116710BLNR back on October 31 and I figured I’d post a quick ‘honeymoon’ report after having worn the watch for a long month. 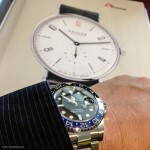 Even though, the GMT-Master II is 40mm, it does feel like it wears bigger than my OMEGA Seamaster Aqua Terra at 41.5mm. 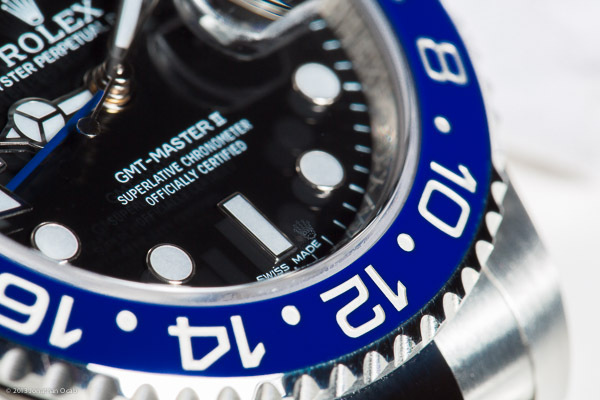 I think the case lugs on the GMT-Master II gives it more of a bulkier look and feel (wide lugs) than the Aqua Terra, but not by much. 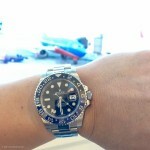 By no means is the GMT-Master II a big watch. It still fits comfortably with a dress shirt. 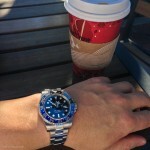 The bracelet feels like it wears ‘stiffer’ than my OMEGA Aqua Terra, as well. I’m not sure if it still needs the ‘break-in’ on the links, or if it’s simply because the links are bigger than those on the AT. 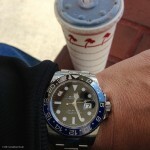 Visually, it’s a joy to look at it on my own wrist. The ceramic (“Cerachrom”) bezel is absolutely beautiful not just because of the two-tone color scheme, but also the shine/gloss of the ceramic and the platinum coated bezel engravings. 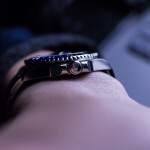 The readability of the watch is great. The Cyclops over the date doesn’t really interfere with reading the hour, minute, second, or GMT hand when any of them pass underneath. 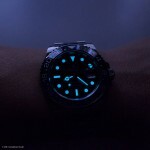 The watch currently does not gain time. When I place it dial up on a table overnight, it won’t gain or lose time (+/- 0 seconds). If I place it crown down, it will lose around 1 to 2 seconds overnight. 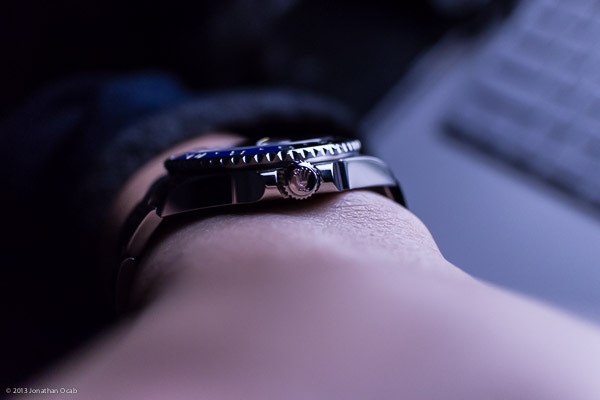 I truly do love this watch and I am glad I decided to purchase it, even though it means I have to delay purchasing the Jaeger-LeCoultre Master Ultra Thin Moon 39mm. 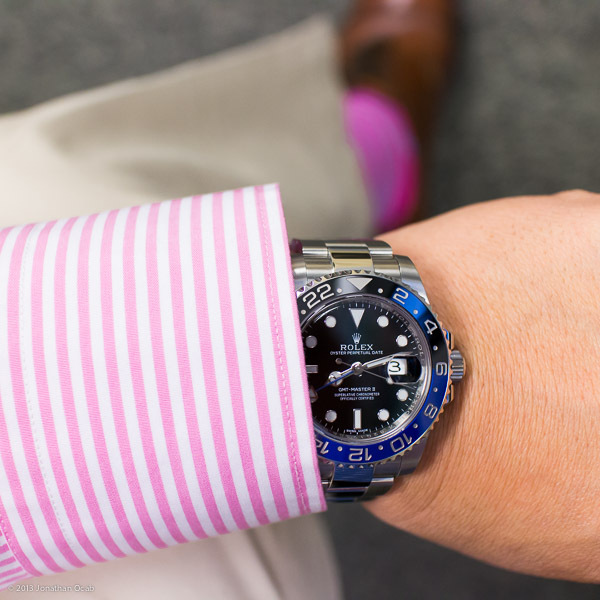 But the 116710BLNR is a great all-around, every day watch. Short of black tie events, the GMT-Master II is a keeper.